What is most striking about Tim Burton's 2010 remake of Alice in Wonderland is the tree beside the hole which Alice (Mia Wasikowska) falls into; it's the exact same "Tree of the Dead" from Burton's Sleepy Hollow of 1999 from which Johnny Depp as Ichabod Crane summons the Headless Horseman (Christopher Walken). 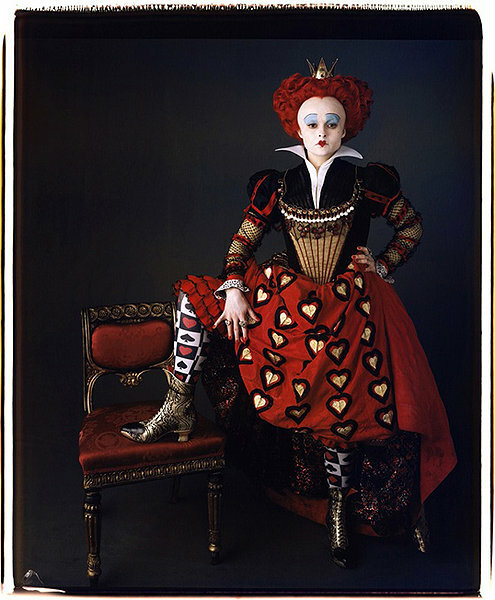 Invoking the classic tale of Alice from 1865 also invokes the Victorian era which gave birth to her and suggests that something is similar today to what was back then. But it also means that the statements which Burton made about America in the great American classic The Legend of Sleepy Hollow are comparable to the statements being made in the English classic Alice in Wonderland (please see my post The Legend of Sleepy Hollow and the Battle For America). Or, what I really mean to say is (please don't let me confuse you) whatever Burton's purpose in making Sleepy Hollow about America, he's making the same statement in his Alice in Wonderland about Great Britain. 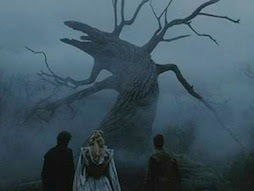 Tree of the Dead from Sleepy Hollow wherein the Headless Horseman lives and, wherein Alice falls in Alice in Wonderland. 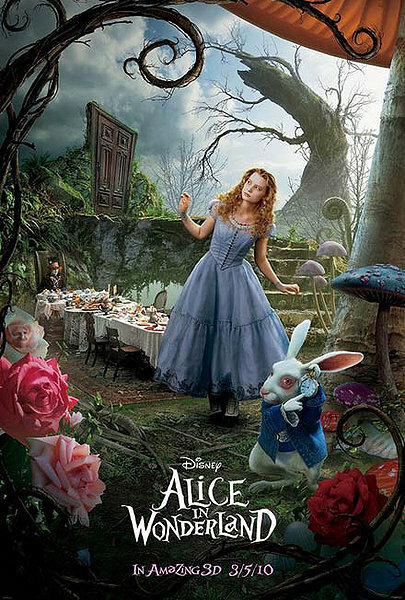 What is so "upside-down" about Burton's story of Wonderland, is that Alice (as a symbol of Great Britain) wants freedom for herself, and, despite her active imagination, cannot understand how trading posts in Hong Kong infringes upon their freedom or that expanding trade into Rangoon will multiply problems. In Lewis Carroll's novel, Alice finds herself in a world where the benefits and assurances of being a British citizen are no longer applicable or protective of her rights and Burton holds true to this, but paints for us an Alice more concerned with figuring out things about herself than just getting back home. Another difference is the death of Alice's father, Charles (played by Marton Csokas who just appeared in the brilliant film The Debt) and that always symbolizes the death of "founding fathers," which, in this case, symbolizes the "pioneering spirit" of Imperialism and trade which caused the Empire to go forth and conquer with red tape. That spirit is the "muchness" which Alice has lost and must find to fulfill her duty to defeat the Jabberwocky. The nearly tedious episode where Alice has landed after her fall and tries all the doors, then finds the key, but it opens a door too small for her, and then she has to drink the potion to make her small... is quite symbolic. Doors are symbolic of destiny, and when they are closed, it signifies what is not our destiny; when they are open, it "lightens the path" of self-fulfillment we are to make. Alice finds all the doors locked; when she finds the key, the only door it fits is "too small for her," and therein we find the predominant symbol and even "conflict" of the film: size matters. 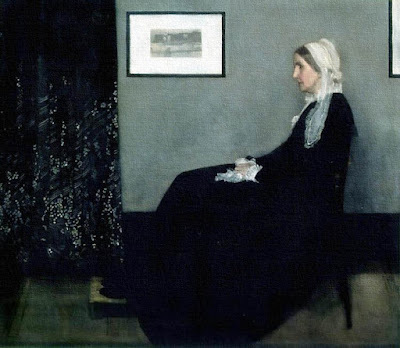 The British Empire is too large (today) to enter the door by which it must find it's destiny. But, if it be too small, it won't be strong enough to "hold onto the key" that will unlock the door. Mad as a hatter, yet? 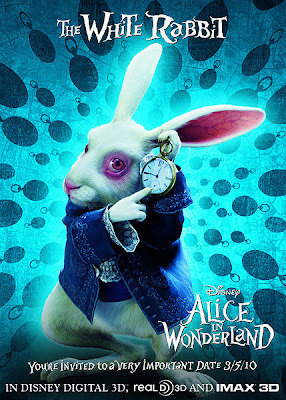 Why is the white rabbit symbolically important? A rabbit is a pest, eating everything and mating rapidly, so it's a symbol of the appetites that, like Alice, we chase after and which causes us to "fall." The waistcoat of the rabbit shows how we "dress up" our appetites in illusions "more suit-able" so whatever it is our appetite craves, it doesn't appear to be that at all. Why the watch? Time invokes history, and Burton is reminding Great Britain what the world was like in 1865 and how some things still haven't changed... but others have. "Down with the bloody Big Head," the slogan of the "underground" movement to take back the throne from the Red Queen (Helena Bonham Carter) and restore it to the White Queen (Anne Hathaway) isn't different than the Red Queen's slogan to keep the White Queen's forces in order, "Off with his head!" What is most striking about the Red Queen? Her big head, just like The Elephant Man, her head is too large (please see my post The Ugly Face of British Imperialism: The Elephant Man). The head symbolizes the governing function, because it is the sign for the faculty of reason and the head "governs" the rest of the body. When she says, "I need a pig here!" so she can place her feet on it, the pig, of course, symbolizes the appetites again (especially since she's resting her feet on its belly, the place where we feel hunger) but the feet symbolize our will, since the feet "take us where we want to go," our will is our self-determination of where we want to go. Her will is led by her appetites, which should translate to an all-too-large British government being led by its appetites just as in 1865. 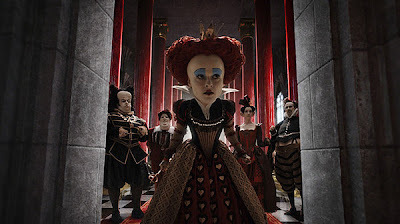 In a sense, the "big head" of the Red Queen illustrates a British government which has become too big for it's own good; how? The Red Queen is "red": just like the dresses of the two little girls in Leisure Hours, red means the "appetites" and the government has been governed by its appetites instead of sound judgment (please see my post Leisure Hours and Victorian Consumption). But the appetites are an "effect" and not a "cause"; what "caused" the government to be governed by its appetites? 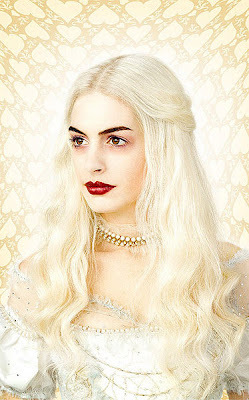 Anne Hathaway as the White Queen. In her reign, the world is in balance and is fruitful. The reason the trees in both Sleepy Hollow and Alice in Wonderland are important is because it symbolizes the wood of the Cross. In a world where faith is dead (like the trees) only our appetites will thrive and we will be ruled by the dragon (the devil) Jabberwocky. The White Queen symbolizes faith and purity, a government in which the wood of the Cross can live without withering and all will be able to find "balance and harmony" and size will be proportionate, not "too large, nor to small." "Death" and "darkness" comes with the Red Queen because the forests have been destroyed. This isn't a "green" statement, it comes from the poem Jabberwocky. The destruction of the forest means the destruction of Christianity and its emphasis on restraining/disciplining the appetites and passions (please see my post Contagion: Bats and Pigs for the way Christianity has been removed from culture and the consequences). The Jabberwocky of the Red Queen symbolizes the ancient enemy, the devil (see the Book of Revelations, please). To slay the Jabberwocky, Alice must use the "vorpal sword," that is, the Sword of Truth which is locked up and can only be discovered "through the looking glass," which means "mirror," which means self-reflection, meditation and the acceptance of one's destiny. 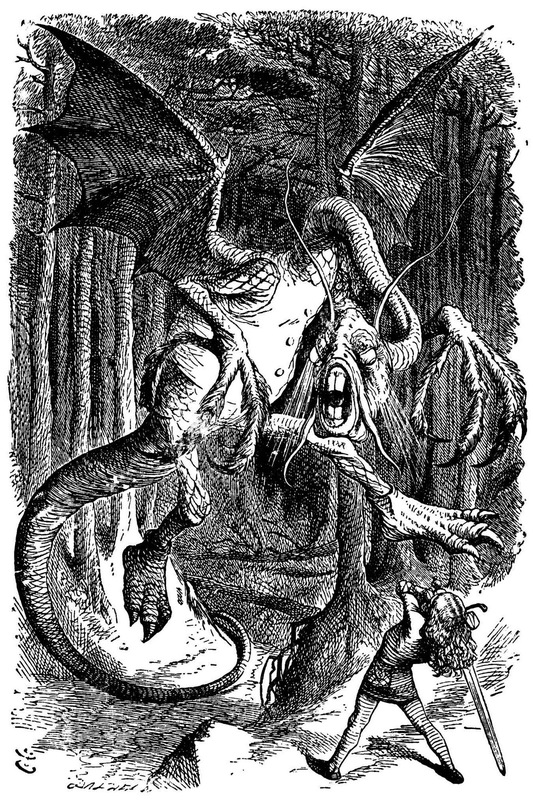 An illustration of the Jabberwocky and Alice. The Jabberwocky destroys all that is good in the world. Unless each one of us, in our turn, slays the Jabberwocky in our own life, we are unable to fulfill our destines. 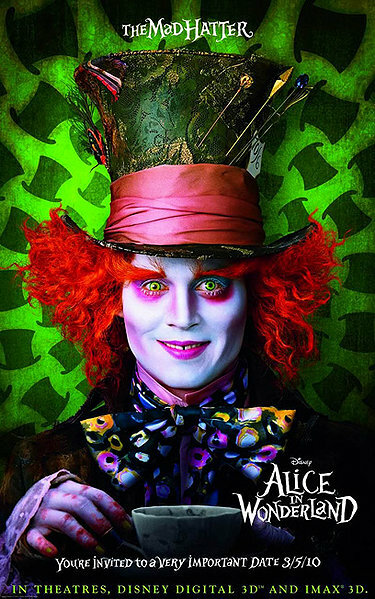 Alice tells the Mad Hatter (Johnney Deppy) that she couldn't slay the Jabberwocky "even if I wanted to," to which he says, "You were much muchier before. That's it. You've lost your muchness." If we place it in terms of the British Empire, then we are seeing a case of the Empire not willingly going forth and slaying the enemies as it should... we will examine this in the two upcoming (and final posts in the series of British Imperialism in film, Sherlock Holmes and the Completion of London Bridge and James Bond: Beyond Boundaries this week). What about America? Is Burton inviting Americans to see themselves in Alice in Wonderland? Absolutely, although Americans hate to think of an "American Empire," we have certainly spread our presence across the Atlantic and Pacific oceans. Do we fail to exhibit our "muchness?" Well, maybe like King George VI (Colin Firth) in The King's Speech, our stuttering signifies our self-willed holding back of power (please see The King's Speech: Self Censorship). Having her own big head isn't enough, everyone has to be "over-sized," too. Just as in the film Mary Poppins, supercalifragilisticexpialidocious covers up the truth of the arms race England was in during the Cold War, in Alice in Wonderland, "Um" (the name Alice tells the Red Queen when asked who she is) covers up the purpose and destiny of Alice: to slay the Jabberwocky (please see my post Mary Poppins: Frankenstein and Animal Farm). In this sense, too, "Um" covers up the real identity and destiny of Great Britain: to be a world leader and not just a sipper at a tea party.